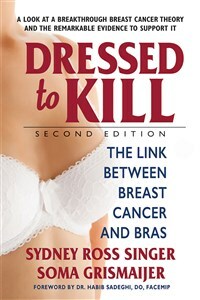 In 1995 the first edition of Dressed to Kill: The Link Between Breast Cancer and Bras revealed the disturbing results of a study that showed a notable correlation between the wearing of bras and the incidence of breast cancer. The women studied who wore bras 24 hours a day were 125 times more likely to have breast cancer compared to bra-free women. Instead of experiencing interest in their research, Sydney Ross Singer and Soma Grismaijer were subjected to a barrage of mercurial assaults. Industry representatives refused to consider the results and dismissed the book out of hand. Mr. Singer even became the target of personal scrutiny. The American Cancer Society took the unusual step of issuing statements of absolute condemnation that were devoid of scientific methodology. The authors had clearly upset the status quo. But despite the continuous attacks, the evidence would not disappear. The authors were determined to get their message out. They were emboldened by people who contacted them from around the world with messages of support. New studies and research emerged that was consistent with their own research. So much so that it became clear that an updated book was needed. So vociferous are the opponents of this theory that the publisher received threats if they proceeded with publication of the book. The details of this incident are included in the book's Foreword. Breast cysts and cancer are epidemic at this time in history. The healthcare industry says that the cause of 70 percent of all breast cancer is unknown. Dressed to Kill helps solve this mystery, explaining how one of the greatest threats to breast health is something that women do to themselves every day. This book has its roots in a personal crisis in the authors’ lives, when Soma was shocked to find a lump in her breast while pregnant. Looking for clues regarding the cause of the lump led this husband-and-wife medical anthropology team to develop a new theory and to conduct an extensive survey of nearly 5,000 United States women, half of whom had breast cancer, in an attempt to uncover a hidden cause of this devastating disease. Pioneers in the new field of Applied Medical Anthropology, Singer and Grismaijer explain their unique approach to researching and understanding the cultural causes of disease in easy-to-read language that is accessible to the layperson and professional alike. Dressed to Kill has already had an impact on the healthcare and fashion worlds, moving some doctors to rethink the prevention and treatment of breast disease, and some clothing designers to rethink their products. Controversial for its challenge to established custom and medical dogma, this breakthrough book is already a classic, and in this updated edition, it continues to suggest new ways of dealing with an old and all-too-common women’s health issue. attended the PhD program in biochemistry at Duke University. He then transferred to Duke's anthropology department, from which he received his MA degree. He later attended the University of Texas Medical Branch at Galveston as an MD/PhD student, with PhD studies in medical humanities. In addition to being a highly sought-after speaker, Syd is also the author of several groundbreaking books on lifestyle-related health problems. Soma Grismaijer was trained as an optician and an environmental planner and has an AA degree in behavioral science and a BA in environmental studies and planning. She and Syd are codirectors of the Institute for the Study of Culturogenic Disease. They are also codirectors of the Good Shepherd Foundation, a nonprofit organization dedicated to human, animal, and environmental health. Her other projects include protecting wildlife from the use of poisons, and finding a cause and cure for pet eye disease. Currently, Soma and Syd live on a rainforest preserve and animal sanctuary located on the Big Island of Hawaii.